The sponge cake worked out well I think, it was a bit like meringue, we found the recipe on food.com. We only did half a batch as we only wanted to make a small trifle, but next time we will put it in a bigger bowl we bought, I think the half batch will fit better in that. We made the jelly separately, with raspberries in it which worked really well. Canned peaches were also very nice, they looked good on top of the squares of jelly facing outwards. Then a layer of custard on top of the peaches, it was a bit thick, maybe 4 cups will be enough for the big bowl. I think we should use lactose free milk instead of soy milk for the custard. Then I decorated the top of the trifle with fresh strawberries and kiwi fruit, the strawberries were especially yummy! 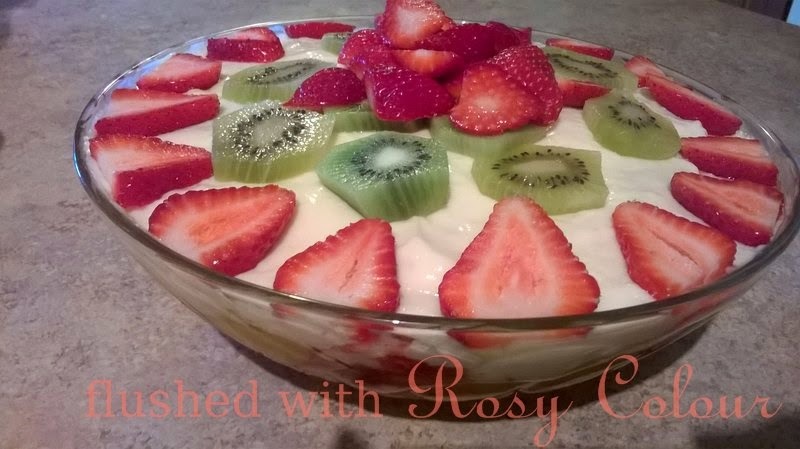 I'm wondering if I can make a healthy trifle, we usually serve fruit salad, but I'm thinking trifle would be good instead of that.